Thank you for participating in the 2017 Foundation for Belmont Education Youth Spelling Bee. Don’t forget that the goal is to have fun, so relax and smile! Grades K-4 will be non-competitive; you’re a winner just by participating and helping our schools. Each word will be given several times, including in a sentence. If you can’t hear, please raise your hand. Each team will have a small whiteboard, and can designate one writer or rotate; but everyone should help the writer. Remember to be as quiet as you can! Do not spell aloud; do print your answers. The pronouncer will call out the words to be spelled. You will have 20 seconds to write the word. We will give you a warning after 10 seconds. After 20 seconds, a bell will ring. If you are not finished or are having trouble, do not worry; just do the best you can. When the time is up, hold up your board so we can see the word you have spelled. Do not erase the word until we tell you to do so! Teams will be told if their word is correct or incorrect, but there is no elimination. We will tell you when it is the last word, so please remain standing until we have finished spelling all words. At the end of your turn, we will have a prize for you; please walk over to the Prize Person when we tell you to do so. Please remember to be quiet in the audience. Each team will have a small whiteboard, and can designate one writer or rotate; but everyone should help the writer. The pronouncer will call out the words to be spelled. We will use words both on the provided word list and off-list. You will have 20 seconds to complete the word. If you get a word wrong, one of the judges will ask you to put one stinger (located on your team table) down. If you have 2 stingers down, your turn is over and you are finished spelling. You will then be escorted off the stage. We will have prizes for everyone, and a special prize for the first and second place teams. 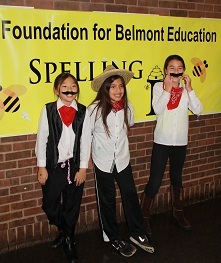 More than 600 Belmont school children participate in the Bee each year! The Foundation for Belmont Education (FBE) works with residents and businesses in the Town of Belmont, Massachusetts to raise private funds that are used to enrich the education provided by the Belmont Public Schools. © 2019 The Foundation for Belmont Education. All Rights Reserved.